May sees the Fashion In Film Festival in London, a retrospective showcase of film and video work on fashion, taking place at three London venues – Ciné lumière (French Institute), The Horse Hospital and the Institute of Contemporary Arts (ICA). 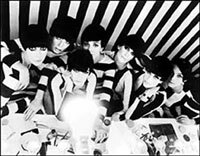 There’s a mix of early and classic cinema, contemporary art and documentaries, but the highlight for me is a rare screening of the rarely seen cult fashion flick Qui êtes-vous, Polly Maggoo?, introduced by its director, William Klein. Film screenings will be followed by lectures, informal talks and Q&A sessions with filmmakers, artists, critics and fashion designers. For a full listing of all events, check out the website.